We have been studying the poetry from ‘Through Our Eyes’ in English class. My Year 9 High school students in Australia spent a few weeks reading and reflecting on the insightful and inspiring poetry from IkamvaYouth. 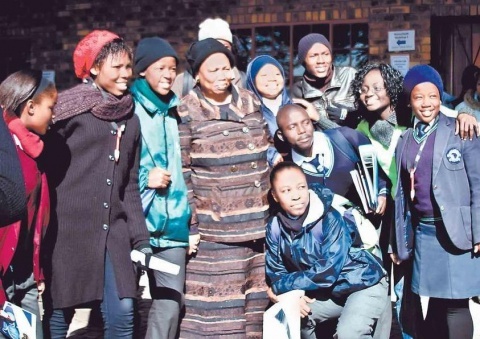 I, their teacher, spent a year in Cape Town in 2008 and volunteered with Ikamva as a tutor as well as taking part in all the other wonderful things that were being done. I was at the exhibition of the photos from the book and ran an interactive body percussion workshop at the launch. Some of you might remember the slogan we sang: Pictures are our stories of the world through our eyes. As a result, it was so exciting when I started teaching in High school and realised that I could use this opportunity to spread the story of IkamvaYouth, a self sustaining, innovative organisation. At the same time, I could expose my students to some new themes and introduce them to some of the passionate people I had met, through their poetry. 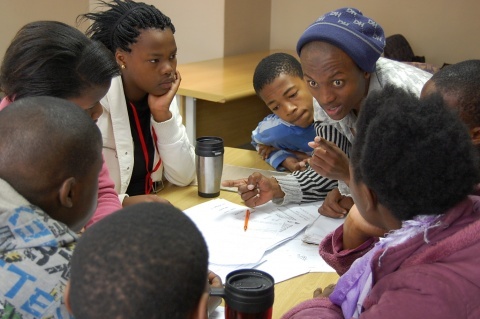 We spent a few classes discussing HIV and AIDS, exchanging information that is essential for all young people. This tied in very well with Thobela’s poem ‘I want the meaning of Positive’ and it sparked much conversation about HIV as a personal and global issue and what life might be like if the word ‘Positive’ took on a new meaning from the one you’d been taught as a child. ‘Do you know your status’ was also another poem that struck my students. Life can be planned. We can strive for dreams, but all that could come to nothing if we don’t know our status. ‘I had never realised’ was another poem that we enjoyed, because it told about how perspectives change as a result of experiences. Often we don’t realise things until they stare us right in the face. This poem allowed us to question our lives and our assumptions, and begin to wonder how many things ‘we’ haven’t realised yet. It also led us to discuss what might be similar in the lives of teenagers in Khayelitsha and Australia, and what things might be different. 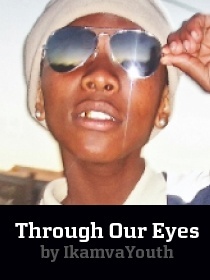 We also spent some time looking at the Photo Gallery on the IkamveYouth website, and that allowed us to spend an afternoon seeing Khayelitsha through your eyes as well as catching a glimpse of some of the poets in the photos. Here are my students’ reflections on some of the poetry. We’d like to thank all the poets and photographers for the snapshot of their lives, that allowed us to enter and learn from the experience. I’d also like to thank Joy for allowing us to share our reflections with you. I was part of the history group so we were taken to the District 6 museum. We were told about District 6 and the different places formed for different people. I didn’t think I would be interested in history, but when we arrived at the museum, it was really interesting. We went around the museum and saw different things being displayed. We did an activity where we had to find things in the museum. There were great poems displayed on the floor of the memorial hall, and you had to choose one but I ended up choosing two because all those poems were good. We were sad because the fun had to end so we went back to TSIBA . The physics and chemistry group was very fun. At first I didn’t understand what we were going to do, because there were these funny machines that I had never seen before. The teacher, Nomfundo, told us that we were making an alarm. I was so confused and shocked because I had never made an alarm before. So many thoughts went through my head. I had never made an alarm before. I made the alarm and when I was confused or didn’t put the material in a right way the tutors were there to help us. When it was time to put the batteries in, everything was good, the sound and the lights were good. It made a good sound, and I was so proud. I wish to do something as exciting today. Yesterday I watched a movie called Human Planet on how people around the world stay alive. I learned how other people find or make their own food. The people shown get their food in the sea. What I loved about the movie, was that the people rely on one another just to feed their families. The whole village or island works together just to put food on the table. Another thing that I loved was that even though hunting for fish in the sea is very hard, people in those countries or islands never give up. They risk their own lives for their people. What I didn’t love was that people in those countries did very dangerous jobs and that is high risk, but I learned that giving up wont help you. You have to struggle to get or to achieve what you want. The movie inspired me a lot, and I wish I could go to sea and try to hunt fish. At the District Six Museum, we learned about the forced removal of people. It was cool. There was a man named Mr. Williams who was one of the people who were forced to move out of their own homes to other countries. We asked him how it felt, and he said it was very painful. Yesterday made me very serious about my future and very confident about it. 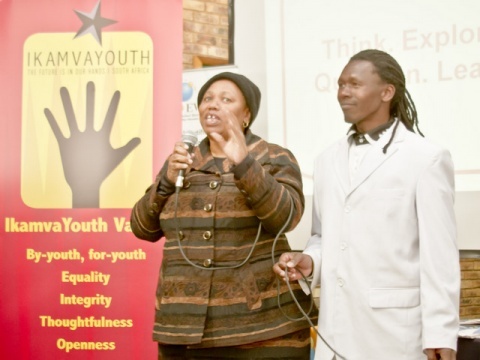 I want to thank Ikamva Youth for the opportunity they gave me. 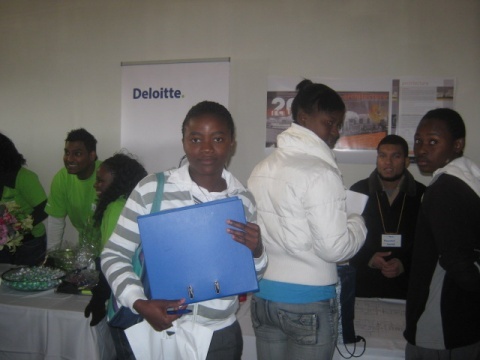 The Careers Indaba comprised of a number of major exhibiting corporates including Deloitte, ABI Beverages, KPMG and Accenture as well as representatives from the CSIR, a collection of tertiary and NGO organizations and over 40 volunteers. 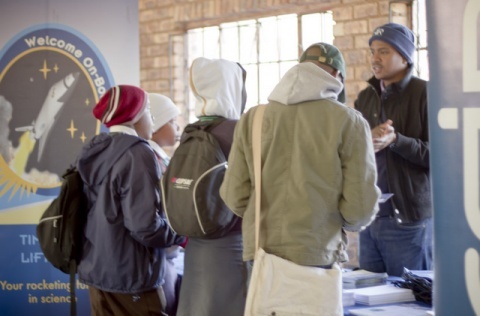 Tertiary institutions like WITS, Midrand Graduate Institute, Ekhuruleni West College and St Augustine College advised interested learners on courses and qualifications required for future study opportunities. Winter School is Finally Here! 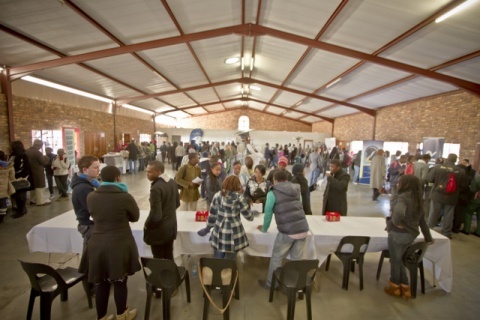 Approximately 120 Ikamva Makhaza learners have gathered today on the TSIBA campus to kick off this year’s Winter School. It will run from Tuesday, 28th June to Friday, 8th July. This morning the learners attended opening speeches and general orientation. They then were divided into interest streams and participated in a short icebreaker session within these groups. These games were followed by tutoring and a delicious lunch, prepared by a former Ikamvanite and now a professional chef, Lungelo. Learners are most excited about this Winter School’s workshops, which range from magazine design to science labs at UCT. 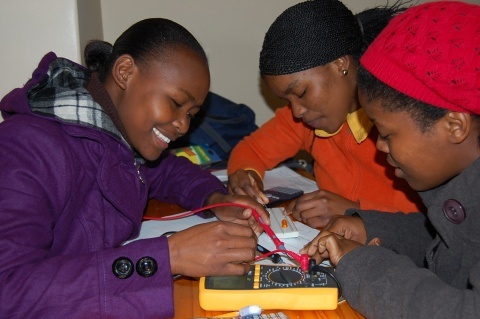 This afternoon learners are engaged in various interesting activities–some are building satellite models with volunteers from CPUT; others are visiting the District Six museum. Look forward to more news about the exciting events of the upcoming two weeks! It was a trip that I will never forget because I learned so many things. I enjoyed going to Clanwilliam because I learned about rock art, how the bushmen used to live, and also about the rocks and plants. I learned more about the Table Mountain, for example that it is made out of sandstone. I’ve been asking myself how this big place could have been made out of sand. Then we arrived to Clanwilliam. Although the village is small, it is a fun and interesting place. Next morning we woke up early to go see the San rock art. We saw paintings of men, women and animals and learned about how they were painted and also what they tell us about the San. Then we went back to Cape Town. The part of the trip that I enjoyed the most was having fun with my friends and eating good food. 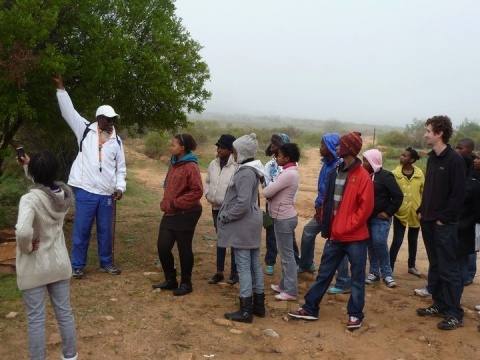 Another thing that I enjoyed was talking to the UCT students who went on the trip with us. Overall, it was a good weekend.